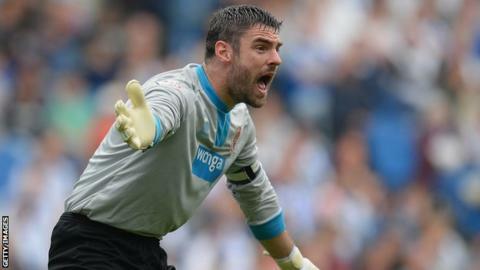 Goalkeeper Matt Gilks says Blackpool's home support will be crucial when the battle to avoid relegation from the Championship concludes this weekend. Cheered on by more than 3,500 fans, Barry Ferguson's side won 2-0 at Wigan on Saturday and will secure survival by beating Charlton on the final day. "The support at Wigan was superb," Gilks told BBC Radio Lancashire. "If that can be replicated back at Bloomfield Road on Saturday, that 12th man will surely get us over that line." Gilks, 31, saved a first-half penalty against the Latics before goals from Andy Keogh and Stephen Dobbie sealed a third win in 28 league games, and a first away from home since 2 November. Blackpool's last home fixture against Burnley on 18 April was halted for several minutes in the second half while tennis balls and tangerines, thrown onto the pitch by fans protesting against chairman Karl Oyston, were cleared. They have lost their last three home games but their destiny is now in their own hands after collecting four points from away matches at Brighton and Wigan. Blackpool are currently three points clear of the relegation zone and a draw on Saturday will be enough for them to survive if Birmingham lose their game in hand, which is at home to Wigan on Tuesday. Ferguson, who has been in temporary charge since Paul Ince was sacked in January, added: "We've got to get the job done, but I never mentioned once about the dreaded 'r' word. "I've always believed in the boys in that dressing room. The hard work paid off on Saturday, but we're not going to rest here."